The Government Technical Institute began its educational services in Guyana in 1951 and was established as a part of a programme instituted by the then British Guiana Government to meet the increasing demand of the industry for trained personnel on whom Guyana’s continuing economic development so largely depends. As early as 1931, the Director of Education of the colony established a wood-working Trade Centre at Kingston, offering full-time training in Cabinet Making and Mechanical Drawing. Similar centres were established in New Amsterdam and Fellowship, West Coast Demerara and presently in Linden. In 1947, the then Adviser on Technical Education recommended the establishment of a technical Institute and subsequently Mayor C.E. Darlington was named as the first principal. Over the years the Institute expanded considerably and now contains an arrear almost sixty six thousand four hundred (66,400) square feet of floor space in four buildings including workshops and laboratories, classrooms, administrative buildings and other service areas such as library, stores, common room, canteen and ancillary staff facilities. The Science laboratories and the Business Education classrooms are housed in a two storey building donated by Messrs. Sponsors Ltd. and Barclays Bank International as gifts on Guyana attaining Independence in 1966. This building, 2008 was refurbished by the Guyana Bank for Trade and Industry (GBTI). Classes commenced for the first in May, 1951 in accommodations provided at Queen’s College, and the official opening was on the 21st of September, 1951.In the beginning the institute offered only Craft level course. Technician level courses in Building Construction and Electrical and Mechanical Engineering were introduced in1958; full-time courses in Surveying came in 1960 and Business Education in 1961. To ensure the full use of the buildings, various cultural activities are presented each school term, both by the student body and other cultural organizations outside the institute. When the Government Technical Institute first opened its doors in 1951, it registered and admitted one hundred and fifty students (150), today that figure has grown considerably to two thousand (2000) students who are registered in both full-time, part-time and day release courses. 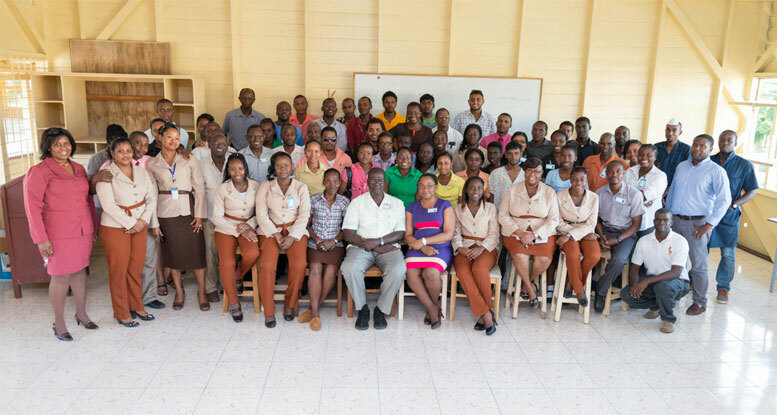 The Government Technical Institute is fulfilling a very important function in the Educational System of the country – that of providing programmes of study for students to acquire the employable skills required by the Industrial and Commercial areas of both the Public and Private sectors of the Co-operative Republic of Guyana. In 2010 (fifty nine years after opening its doors) at the Government Technical Institute, there have not been any significant changes to the educational system and the Institute is still equipping both young and old Guyanese and Foreign students who seek to have employable skills at the Institute. In doing so the Institute currently manages seven departments in which a student has a wide array of courses to choose the one that best fits his/her intended career. These departments consist of the Building Department, Electrical Department, Mechanical Department, a Business Department, a Science Department, an Information Technology Department and a Land and Surveying Department. The departments offer a wide range of different courses in which a student can obtain a Diploma or a Certificate in the completion of their studies. The institute caters for the students who completed secondary school studies as well as those who are employed. Students can pursue their studies on a Full-Time, Part time (Evening) or Day Release basis. The programmes offered are Technician Diploma, Technician Certificate, and Craft Certificate and recently in 2012 the institute began offering programmes at the Competency Based Level 1 and 2. The buildings and classrooms are repaired and service each school year or when the needs arises. The library has been optimized with new books for students to research and do studies. The library is equipped with computers complete with wireless access to facilitate research. If a student wishes complete studies in a quiet and in a conducive environment then he/she can do so at the on the lawns which has benches and trees to block out the heated sunshine. There is also a games room facility for students to enjoy indoor sporting activities and a tarmac to enjoy outdoor sporting activities of the Institute. Wifi services are offered across the entire compound for students and staff. The Government Technical Institute has registered over five thousand (5,000) students and continues to increase its Lecturing, Administrative and Office Staff in an effort to offer the best in technical education in the country.